Well-appointed suites free Wi-Fi and free breakfast are a few of the plusses our guests report at the non-smoking Residence Inn by Marriott Mobile. The 66-suite hotel provides contemporary apartment-style living thanks to its studio one- and two-bedroom accommodations. 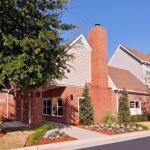 Each offers a full kitchen equipped with granite countertops cooking utensils and dishes. Rooms also feature work desks flat-panel HDTVs and luxurious mattresses and bedding. Pets are welcome for an additional fee. Guests are treated to a complimentary hot breakfast buffet each morning and a reception on Monday through Thursday evenings. The Residence Inn Mobile also boasts an indoor pool fitness center and outdoor patio with fire pit. The Residence Inn by Marriott Mobile is just off I-65 around the corner from the Springdale Mall and the Colonial Mall. The hotel is six miles from downtown Mobile and the Mobile Civic Center and eight miles from Mobile Regional Airport.